Entries are open online for the Mullingar Equestrian Performance Horse & Pony Sale on Sunday 23 June for three year olds and upwards. Early entrants will get the best exposure online to potential buyers. Good quality photos and video links will help you find the right buyer for your horse or pony. Vet certs are not obligatory, but a current vet cert will always be helpful to achieving a good price at the sale. There will be a vet in attendance on the sale day, and buyers have the option of having their purchase vetted. For any queries don’t hesitate to contact our sales expert, Aidan on 087 2842814 or Declan in the Sales Office on 086 0331536 if you need any assistance with your entries. Mullingar Equestrian offers top class facilities to see the horses and ponies being ridden, and to try them out for yourself on the day. 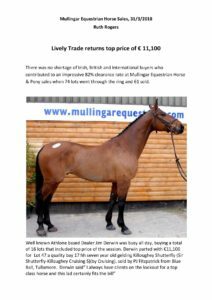 Mullingar Equestrian sales venue is centrally located and easily accessible for buyers and sellers. Stabling is included in the entry fee. Payments issue in ten working days from auction, once the sale has cleared.